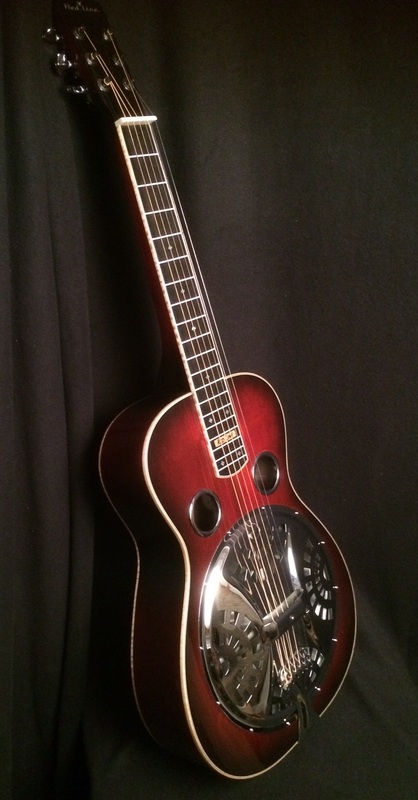 Here is a very nice RedLine Resophonic Guitar, which includes several unique appointments. It was originally a Custom Build, but the deal fell through, making this fine guitar ready for you! 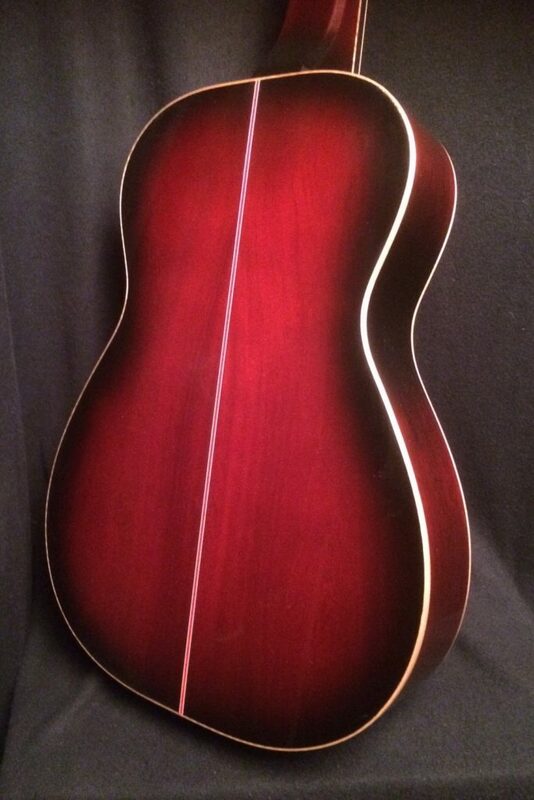 It is a full Mahogany build, with ebony appointments. Some other stand-out features are: Unique Sunburst Finish, Locking/Cutting Tuners, fancy fret markers, Figured Maple Binding on Body, Neck, and Headstock. the volume you are likely to ever need. Incredibly great tone too, both up and down the neck. Crystal clear noting, which is extremely well balanced across all six strings. 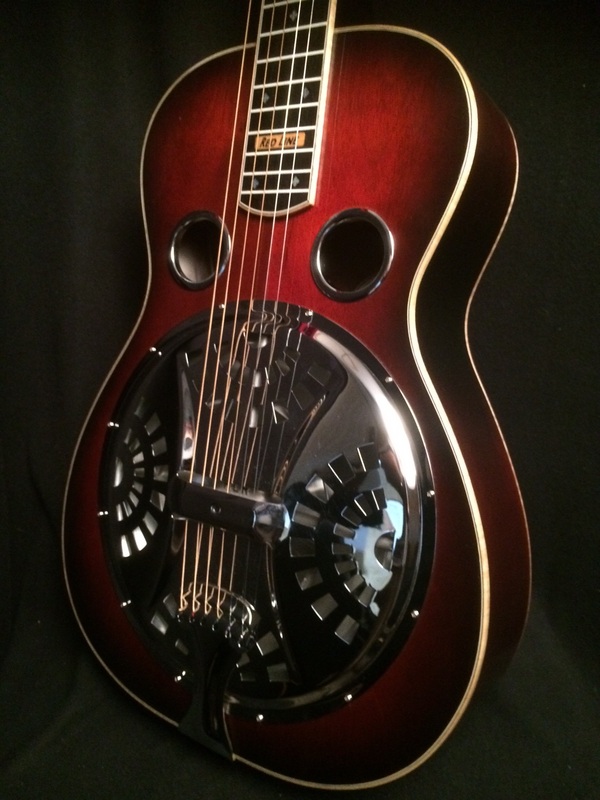 You see, over the years we have developed our own unique “recipe” for building our RedLine Resophonic Guitars. The combination of our “open” internal structure, along with our spruce support dowels, our own RLR Spider, U.S. hand-spun cone, and baffle system, along with a high level of detail spent throughout the entire building process all add up to a fantastic sounding and playing instrument. This guitar is no exception! This guitar was on the road for a short time, but it was well cared for during that time, and it is in excellent condition. The price is well below what the price would be if this guitar were brand-spanking-new. Of course, if you want one that way, we can do that too! Price: $2450 This instrument is sold. Please keep looking, or give us a call to find your instrument.